Belgium’s Westhoek is best known as the site of the Western Front during World War One. And certainly no visit to this part of West Flanders and northern France – which spans some beautiful landscapes between Veurne, Dunkirk, Ypres and the Lys valley – would be complete without a visit to one of the many war memorials and battle sites. But visitors are often surprised by the wealth of opportunities the region offers aside from this legendary history. The Westhoek is home to picturesque farmland, enviable walking and cycle paths, award-winning museums and culinary delicacies. For the past four years, the region has been commemorating the centenary of the Great War. The Last Post in fact takes place every evening in Ypres, and has done since 1929. Hundreds of spectators gather at the city’s Menin Gate memorial to the war dead to hear the buglers play the familiar moving call at precisely 20.00. The Westhoek is further dotted with World War One sites, from poignant commemorations such as The Brooding Soldier sculpture at the Saint Julien Memorial in Langemark-Poelkapelle, to the astonishing Tyne Cot cemetery and memorial in Zonnebeke. The largest Commonwealth forces cemetery in the world, Tyne Cot – from its sophisticated rotundas to its lovingly cared-for landscaping to its sheer scale – never fails to elicit an emotional response. Visitors to these memorial sites soon discover the rest of the Westhoek. It’s a paradise for cyclists, for instance, with more than 3,000km of cycling paths criss-crossing villages, farmland and forests. There are several themed routes, such as the Tournée Locale beer discovery trail. A good way to plan a cycling or walking trip is with fietsnet.be and wandelknooppunt.be, which offer do-it-yourself trails: click on numbered junctions to create the perfect length for your walk or bike ride, then just navigate by the numbered signposts along your route. You might find yourself passing a vineyard, particularly if you’re in Heuvelland, which produces some marvellous wines. In Dranouter, for instance, Monteberg has a fruity Rondo Regent Red and a Pinot Gris, while further north in Westouter, Entre-Deux Monts offers prize-winning sparkling wines. Both offer tours and tastings, as do many other wine domains in the Westhoek. There’s a good chance you’ll find these – as well as local beer such as De Plukker and St Bernardus (both from Poperinge, also home to the Hops Museum) – on the menu at one of the Westhoek’s finer restaurants. Don’t miss the two-Michelin-star Hostellerie St Nicolas in Ypres (it’s also a guest house), or Pegasus in Poperinge, one of Gault Millau’s favourite spots in the region. 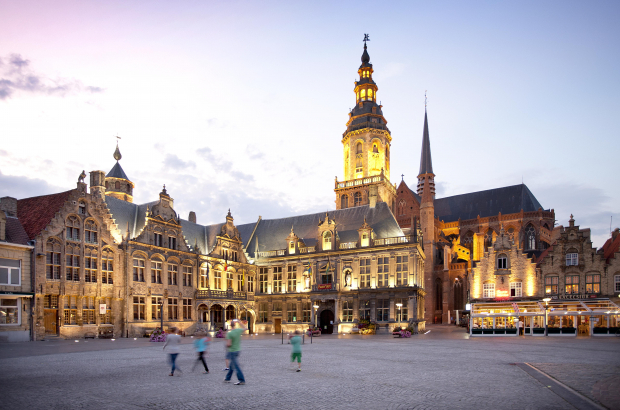 While it’s easy to find war-related museums in the Westhoek – the Dunkirk War Museum and In Flanders Fields in Ypres are two stand-outs – Cassel is home to one of the best art museums in northern France. The Musée de Flandre holds an excellent collection of work by artists from French and Belgian Flanders from the 16th century to today.